For the non-League club, see Bournemouth F.C. A.F.C. Bournemouth (/ˈbɔːrnməθ/ ( listen)) is a professional football club in Bournemouth, Dorset, that play in the Premier League, the top tier of the English football league system. Formed in 1890 as Boscombe St. John's Institute F.C., the club adopted their current name in 1972. Nicknamed The Cherries, since 1910 Bournemouth have played their home games at Dean Court. Their home colours are red and black striped shirts, with black shorts and socks. Bournemouth have spent the majority of their history bouncing between the third and fourth tier of English football. Under manager Eddie Howe, they have risen through the pyramid; the 2015–16 season was A.F.C. Bournemouth's first ever in England's top division. The club is currently owned by Maxim Demin, a Russian multi-millionaire involved in the petrochemicals trading industry. Although the exact date of the club's foundation is not known, there is proof that it was formed in the autumn of 1899 out of the remains of the older Boscombe St. John's Institute F.C. The club was originally known as Boscombe F.C. The first president was Mr. J. C. Nutt. In their first season, 1899–1900, Boscombe F.C. competed in the Bournemouth and District Junior League. They also played in the Hants Junior Cup. During the first two seasons, they played on a football pitch in Castlemain Avenue, Pokesdown. From their third season, the team played on a pitch in King's Park. In the 1905–06 season, Boscombe F.C. graduated to senior amateur football. In 1910, the club was granted a long lease over some wasteland next to Kings Park as the club's football ground by local businessman J.E. Cooper-Dean. With their own ground, named Dean Court after the benefactor, the club continued to thrive and dominated the local football scene. The same year the club signed its first professional player Baven Penton. Around about this time, the club obtained their nickname "The Cherries," with two foremost tales on how the club gained the nickname. First, because of the cherry-red striped shirts that the team played in and, perhaps less plausible, because Dean Court was built adjacent to the Cooper-Dean estate, which, it is believed may have encompassed numerous cherry orchards. For the first time, during the 1913–14 season, the club competed in the FA Cup. The club's progress, however, was halted in 1914 with the outbreak of World War I, and Boscombe F.C. returned to the Hampshire League. In 1920, the Third Division of the Football League was formed, and Boscombe were promoted to the Southern League, finding moderate success. To make the club more representative of the district, the name was changed to Bournemouth and Boscombe Athletic F.C. in 1923. During the same year, the club was elected to the newly-expanded Football League Third Division. The first league match was at Swindon Town on 25 August 1923, which Bournemouth lost 3–1. The first league game at Dean Court was also against Swindon, where Bournemouth gained their first league point after a 0–0 draw. Initially, Bournemouth struggled in the Football League but eventually established themselves as a Third Division club. Bournemouth remains on the records as the longest continuous members of the Third Division. 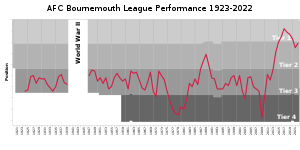 As a league club, Bournemouth had to wait until after the Second World War before winning their first trophy. This was accomplished as they beat Walsall in the Third Division (South) Cup in the final at Stamford Bridge. Under manager John Bond, the club adopted the more streamlined A.F.C. Bournemouth name in 1972. At the same time, the club adopted a new badge as a symbol of the club's progress. The stripes in the background were based on the club shirt, while in the foreground is the profile of a player heading the ball, in honour of Dickie Dowsett, a prolific scorer for the club in the 1950s and 1960s. Their red and black kit, introduced in 1971, was based on the A.C. Milan strip. This was the era of Ted MacDougall, a prolific goalscorer who, in an FA Cup tie in November 1971, scored nine goals in an 11–0 win against Margate. Chart of yearly table positions of Bournemouth in the League. The club recorded a famous victory over holders Manchester United in the FA Cup in January 1984, while they were managed by Harry Redknapp. Redknapp took Bournemouth into the second tier of the English league for the first time in their history as Third Division champions in 1987. After comfortably surviving in their first season in the Second Division, Bournemouth made a serious challenge for promotion to the top flight in the 1988–89 season; they ultimately fell away after a poor run late in the season, but their eventual finish of 12th place remained their highest-ever in the Football League until the 2013–14 season. On 5 May 1990, the final day of the 1989–90 season, Leeds United had the chance to win the Second Division and gain promotion into the First Division by beating Bournemouth at Dean Court. Some United fans had already caused trouble in the town during the morning and the atmosphere was tense as Leeds won the match by a single goal. Combined with the results of other matches, this meant that Leeds were promoted while Bournemouth were relegated. The violence and destruction by visitors to Bournemouth continued over the holiday weekend, causing more than £1 million worth of damage and injury to opposing fans and police officers. The town's Daily Echo newspaper reported that "spectators, including many young children, had to run to safety as missiles were hurled and riot police waded in to control the crowds." The matter was raised in Parliament by one of the town's MPs. Financially, the Leeds trouble affected the club for more than a decade, as Bournemouth were prevented by local police from staging home games on Bank Holidays (traditionally a popular day for football) until a game against Shrewsbury Town on 21 April 2003. Redknapp remained at the club for two more seasons, both of which ended with the club falling three points short of the play-offs. However, mounting financial pressures caused him to resign his position at the end of the 1991–92 season, and he subsequently rejoined former club West Ham United as a coach. He was replaced by Tony Pulis, who built a much cheaper squad that could only manage two consecutive 17th-place finishes before Pulis walked out of the club, blaming financial pressures. Bournemouth went the first few months of the 1994–95 season without a permanent manager in place, and a dreadful start saw them bottom of the table for much of the first half of the season. Despite a minor upturn in form when Mel Machin was appointed as manager, they looked highly unlikely to survive, given that there were five relegation spots in Division Two for that season due to league reconstruction. However, a late run of form combined with collapses by relegation rivals Cambridge United and Plymouth Argyle saw them survive on the last day of the season by two points. Machin ultimately remained in charge for six years, most of which were marked by unremarkable mid-table finishes. The 1998–99 season proved to be arguably the highlight of his tenure, with the club making a serious playoff challenge for most of the season, but ultimately falling short and finishing seventh. However, a drop to 16th place in the 1999–2000 season followed by a poor start to the following season saw Machin removed from his position and given the role of director of football. Sean O'Driscoll was promoted from the coaching staff in place of Mel Machin at the start of the 2000–01 season. In O'Driscoll's first season as manager, Bournemouth narrowly missed out on the Division Two playoffs but were relegated a year later in the new stadium (in the early part of the 2001–02 season, they played their home matches at Dorchester Town's ground while their own stadium was being redeveloped). The board kept faith in O'Driscoll and they were rewarded with promotion via the Division Three playoffs in 2002–03. The club became the first to score five goals at the Millennium Stadium when they beat Lincoln City 5-2 in the 2002–03 Division Three play-off final with goals from Steve Fletcher, Carl Fletcher (2), Stephen Purches and Garreth O'Connor. Under O'Driscoll, Bournemouth narrowly missed out on the play-offs for the 2003–04 and 2004–05 seasons, and just avoided relegation in the 2005–06 season. Long-serving player James Hayter scored the fastest league hat-trick in English Football League history during the 2003–04 season. The Cherries were leading 3–0 against Wrexham thanks to goals from Stephen Purches, Warren Cummings and Warren Feeney when Hayter was brought onto the field as a substitute. With 86 minutes gone, Hayter managed to net three goals in the space of two minutes and 17 seconds, making the final score 6–0 to Bournemouth. In September 2006, with the team in eighth in the League, Sean O'Driscoll left to become manager of Doncaster Rovers. He was replaced by Kevin Bond. In February 2008, Bournemouth were forced into administration, suffering a ten-point deduction which put them in relegation trouble. Bournemouth had debts of around £4 million and almost went out of business completely. The off-field uncertainty continued throughout the season, with only one, ultimately unsuccessful, bid for the club accepted, and the club ended the season being relegated to League Two. Ahead of the 2008–09 season, the team's future in the Football League was put into doubt when the league threatened to block Bournemouth's participation in League Two, due to problems with the team's continuing administration and change in ownership. It ordered both Bournemouth and Rotherham United to demonstrate that they could fulfil all of their fixtures and find a way out of administration, eventually allowing the club to compete with a 17-point penalty for failing to follow the Football League insolvency rules. The new company was also ordered to pay unsecured creditors the amount offered at the time of the original CVA (around ten pence in the pound) within two years. Early into the season, manager Bond was sacked and was replaced by former player Jimmy Quinn, who would himself leave the club only a few months later. Former player Eddie Howe took over as manager with the club still ten points adrift at the bottom of the league and initially on a caretaker basis, becoming the youngest manager in the Football League at the age of 31. At the end of 2008, it was announced that local businessman Adam Murry had completed the purchase of 50% of the club's shares from previous chairman, Paul Baker. However, in January 2009, Murry missed the deadline to buy Baker's shares. In the final home game of the 2008–09 season, the Cherries guaranteed their Football League status by beating Grimsby Town 2–1 with a winning goal ten minutes from time by Bournemouth's Steve Fletcher, sparking wild celebrations after a fairytale ending to "The Great Escape." They finished their troubled season with their best away win in 30 years with a 4–0 victory at Morecambe. In June 2009, a consortium including Adam Murry finally took over A.F.C. Bournemouth. The consortium included Jeff Mostyn, former vice-chairman Steve Sly, Neill Blake and former Dorchester Town chairman Eddie Mitchell. Howe's first full season in charge brought success as Bournemouth finished second in League Two to earn promotion with two games to spare. Howe subsequently left the club for Burnley during the following season; his successor, another former Bournemouth player, Lee Bradbury, led Bournemouth to the League One play-offs. The two-legged semi-final against Huddersfield Town finished 3–3 after extra time, and Huddersfield went through the final by winning the penalty shoot-out 4–2. Bradbury was unable to lead Bournemouth to another promotion challenge in the 2011–12 Football League One, placing 11th after a season of indifferent results, and was replaced by youth team coach Paul Groves for the final games of the season. Groves remained in charge at the start of the 2012–13 season, only to be sacked in October 2012 following a start which left the club near the bottom of the table. Eddie Howe returned as manager, and not only did he pull the club away from their early-season relegation battle, they achieved promotion to the Championship, returning to the second-tier of English football for the first time since 1990. The club also revealed a new club crest. After a promising start to life in the Championship, the club was handed a fourth Round FA Cup tie with Premier League club Liverpool which ended in a 2–0 loss. Bournemouth finished their first season back in the Championship in tenth place, their highest ever position in the Football League. On 25 October 2014, Bournemouth won 8–0 away at St. Andrew's against Birmingham City. It was the first time that the Cherries had ever scored eight goals in a league game and their largest winning margin in the league (barring a 10–0 win over Northampton Town in September 1939, which was discounted after the league was abandoned due to the Second World War). The club followed up this success with a 2–1 victory over Premier League side West Bromwich Albion in the League Cup, reaching the quarter-finals of the competition for the first time. Bournemouth were again drawn against Liverpool but lost 3–1. The club spent most of the 2014–15 season near the top of the table, and a 3-0 win away at Charlton Athletic on the final day of the season was enough to clinch the Championship title and a first-ever promotion to the top flight of English football. Bournemouth's first ever game in the top flight of English football was a 1–0 defeat home to Aston Villa played on 8 August 2015. Early on in the 2015–16 season the team was beset by a number of crippling injuries, including to their captain, Tommy Elphick and their star striker from the previous season, Callum Wilson, the latter of which was injured for the majority of the season. The team struggled for most of the first half of the season until a turning point was reached during a game at Dean Court against Everton in which Junior Stanislas scored a goal in the seventh minute of stoppage time to tie the game. From there, Bournemouth defeated Chelsea and Manchester United in back-to-back wins. The team eventually finished 16th in the league, securing their Premier League status for another year. Their second season, despite being largely tipped to suffer second season syndrome, they defied all odds to finish in 9th place. Their squad was largely defined by the highly publicized loans of Jack Wilshere from Arsenal and Nathan Aké from Chelsea, but also by the strong form of Josh King, who scored 16 goals in 36 appearances, and the £15 million pound move of Jordon Ibe from Liverpool. A weak start to the season saw them in the relegation zone for the first three weeks, but after a 1–0 victory against West Bromwich Albion, they never again dropped below 16th place in the table. Key points of the season occurred when they soundly defeated Hull City 6–1 and defeated Liverpool 4–3, both of which helped their survival push at the end of the season, when they went unbeaten in the last five matches and earned 11 points from 15. In preparation for the following season, Howe signed Aké permanently for a club-record fee, while Asmir Begović and Jermain Defoe also signed deals at Dean Court. The season began poorly, with the team losing their first 4 matches. However, a run of good form through late December and January saw them steer clear the relegation zone, and saw Howe earn his second Premier League Manager of the Month award. They won 2–1 at home against Arsenal, had a 3–0 victory at Stamford Bridge against Chelsea and gained 19 points from losing positions in the second half of the season; a Premier League Record. The team battled inconsistent form the rest of the season, but still managed a 12th place finish. In 2016, Bournemouth were found guilty of violating the Football League’s Financial Fair Play regulations during 2014–2015, the season it secured promotion to the Premier League. The club’s over-spend broke the ‘maximum deviation’, with a £38.3 million financial loss in 2014–2015. This followed a loss of £10.3 million in 2013–2014. The club was originally fined £7.6 million by the Football League, but subsequently negotiated a settlement with a fine of £4.75 million for breaching Financial Fair Play rules. The decision followed months of speculation and investigation about the club breaking Football League regulations. The team's colours have varied slightly throughout the club's history. Starting off playing in red and white stripes, Bournemouth have also played in all-red shirts, red with white sleeves, and mostly, since 1990, in red and black stripes, similar to that of Milan. A predominantly red shirt was chosen for the 2004–05 and 2005–06 seasons before a return to the stripes for the 2006–07 season due to fan demand. Since 2017 Bournemouth's kit has been manufactured by Umbro. Previously it has been made by Umbro (1974–78, 1983–86), Adidas (1978–81), Osca (1982–83), Henson (1986–87), Scoreline (1987–90), Ellgren (1990–92), Matchwinner (1993–95), Le Coq Sportif (1995–96), Patrick (1996–2000), Super League (200-01), TFG Sportswear (2001–03), Bourne Red (2003–08), Carbrini Sportswear (2008–11, 2014–15), Fila (2011–14) and JD Sports (2015–17). Their shirts are currently sponsored by Mansion.com. 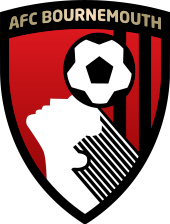 On 2017–2018 season, the Mansion.com logo will appear on the left shirt sleeve of Bournemouth's home and third shirts. In addition, Casino.com, which is a subsidiary of Mansion, will feature on the sleeve of the club's away shirt. Before this, sponsors have been Reg Heynes Toyota (1980–82, 1983–85), Coopers Beers (1985–87), Canberra Homes (1987–88), Nolan (1988–89), A1 Windscreens (1990–92), Exchange & Mart (1992–93), Frizzell (1993–97), Seward (1993–2006), Focal Point (2006–08, 2011–12), Carbrini Sportswear (2008–11), and Energy Consulting (2012–15). ^ Dunne, Michael. Dean Court Days: Harry Redknapp's Reign at Bournemouth. Archived from the original on 20 June 2018. Retrieved 19 June 2018. ^ "2018/19 Premier League Handbook". premierleague.com. Archived from the original on 3 January 2018. Retrieved 3 January 2018. ^ "Who is Bournemouth's Russian owner Maxim Demin?". www.skysports.com/football/news/11743/9827260/who-is-afc-bournemouths-russian-owner-maxim-demin. Retrieved 12 January 2019. ^ "Howe faces test of character as storm clouds gather at cushy Bournemouth". www.thesun.co.uk/sport/football/8171260/eddie-howe-bournemouth-test-of-character-transfer. Retrieved 12 January 2019. ^ "AFC Bournemouth History". Bournemouth: AFC Bournemouth. 12 May 2012. Archived from the original on 26 June 2015. Retrieved 25 June 2015. ^ "AFCB Club History". 24 May 2012. Archived from the original on 26 June 2015. ^ Holley, Duncan; Chalk, Gary (1992). The Alphabet of the Saints. ACL & Polar Publishing. p. 270. ISBN 0-9514862-3-3. ^ "Cherries launch evolved crest". AFC Bournemouth. Archived from the original on 25 September 2015. Retrieved 10 August 2015. ^ Roopanarine, Les (2011). Harry Redknapp-The Biography. John Blake Publishing. ISBN 9781843589426. Retrieved 15 November 2018. ^ Struthers, Greg (8 January 2006). "Caught in Time: Bournemouth beat Manchester United, FA Cup, 1984". The Times. London. Retrieved 17 February 2008. ^ "8 January 1984: Bournemouth 2 Man Utd 0". The Observer. London. 6 January 2002. Archived from the original on 11 December 2008. Retrieved 17 February 2008. ^ a b "Bournemouth, Poole, Christchurch news, sports and jobs. Dorset and Hampshire what's on and leisure – Cherry-o Leeds!". Archive.bournemouthecho.co.uk. 5 May 2004. Archived from the original on 7 May 2010. Retrieved 17 May 2010. ^ "Cherries go into administration". BBC News. 8 February 2008. Archived from the original on 10 February 2008. Retrieved 17 May 2010. ^ "3 April Press conference transcript". Afcb.premiumtv.co.uk. Archived from the original on 4 April 2018. Retrieved 17 May 2010. ^ "Howe handed permanent role". Sky Sports. 19 January 2009. Archived from the original on 2 June 2009. Retrieved 19 January 2009. ^ "Managerless Birmingham City suffered a humiliating defeat as Bournemouth scored eight goals at St Andrew's". BBC. 2014. Archived from the original on 26 October 2014. Retrieved 25 October 2014. ^ "Gallery: All the incredible pictures as Cherries are crowned champions of Football League". Bournemouth Echo. Archived from the original on 5 May 2015. Retrieved 2 May 2015. ^ "Wilson gets winner as Bournemouth beat West Brom". BBC News. 10 September 2016. Archived from the original on 22 May 2018. Retrieved 21 May 2018. ^ Simpson, Christopher. "Nathan Ake Officially Completes Bournemouth Transfer from Chelsea for Record Fee". Bleacherreport.com. Archived from the original on 27 June 2018. Retrieved 27 June 2018. ^ "Bournemouth confirm £10m signing of Chelsea goalkeeper Asmir Begovic on long-term deal". Thesun.co.uk. 30 May 2017. Archived from the original on 28 June 2018. Retrieved 27 June 2018. ^ "Arsenal 3–0 Bournemouth". Bbc.com. Archived from the original on 17 July 2018. Retrieved 27 June 2018. ^ "Howe wins January Barclays Manager of the Month". Premierleague.com. Archived from the original on 27 June 2018. Retrieved 27 June 2018. ^ "Bournemouth 2–1 Arsenal". BBC Sport. 14 January 2018. Archived from the original on 13 July 2018. Retrieved 27 June 2018. ^ "Chelsea 0–3 Bournemouth". BBC Sport. 31 January 2018. Archived from the original on 13 July 2018. Retrieved 27 June 2018. ^ "AFC Bournemouth 🍒 on Twitter". Twitter. Retrieved 16 October 2018. ^ "Premier League Table, Form Guide & Season Archives". www.premierleague.com. Archived from the original on 27 June 2018. Retrieved 27 June 2018. ^ "Bournemouth fined £7.6m after breaching Financial Fair Play rules". www.skysports.com/football/news/11743/10267899/bournemouth-fined-7-6m-after-breaching-financial-fair-play-rules. Retrieved 4 January 2019. ^ "CHERRIES CHARGED AFC Bournemouth agree to pay £4.75million fine for breaching Financial Fair Play rules". talksport.com/football/395272/afc-bournemouth-fine-financial-fair-play. Retrieved 4 January 2019. ^ "Bournemouth face hefty fine by the Football League for breaking Financial Fair Play rules". www.mirror.co.uk/sport/football/news/bournemouth-face-hefty-fine-football-7066844. Retrieved 4 January 2019. ^ "First team". A.F.C. Bournemouth. Archived from the original on 2 April 2016. Retrieved 25 July 2018. ^ "AFCB – Squad numbers confirmed for 2018/19". A.F.C. Bournemouth. Archived from the original on 27 July 2018. Retrieved 26 July 2018. ^ a b "Simon Francis named as AFC Bournemouth captain for the 2016/2017 season". A.F.C. Bournemouth. Archived from the original on 5 March 2017. Retrieved 13 December 2016. ^ "AFC Bournemouth Staff Profiles". Afcb.co.uk. Archived from the original on 6 June 2017. Retrieved 1 April 2018. ^ "Q&A: All you need to know about AFC Bournemouth – Journalism & News from Bournemouth University". Buzz. Archived from the original on 18 May 2015. Retrieved 9 May 2015. ^ "Mansion will sponsor Bournemouth". Slotsday.com. 31 August 2017. Archived from the original on 31 August 2017. Retrieved 31 August 2017. ^ "AFC Bournemouth – Historical Kits". Historicalkits.co.uk. Unknown. Archived from the original on 2 January 2016. Retrieved 18 January 2016. ^ Rollin, Jack (2005). Soccer at War 1939–45. p. 259. ISBN 0-7553-1431-X.